After the huge success of both phases of Al-Kabir Town Lahore. Al-Kabir Developers has also recently announced about the launching of Al-Kabir Town Islamabad. But, did not announce the date of its official launching. 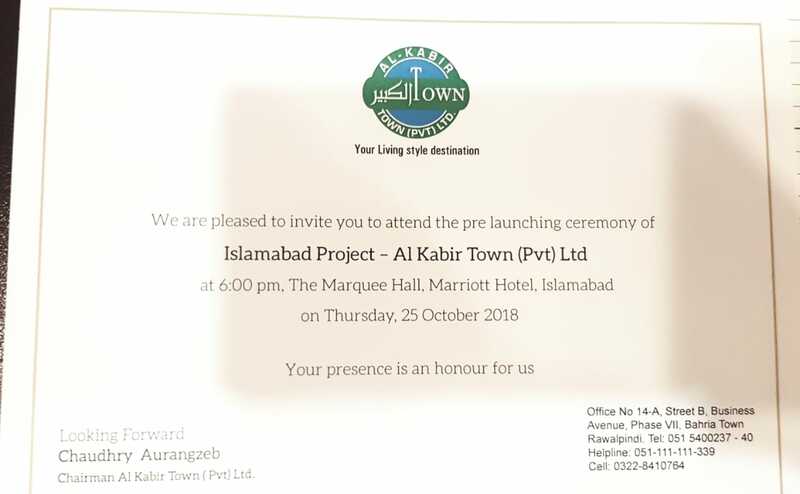 Now, two days ago, Al-Kabir Town has already started sending invitations for the official launching ceremony of Al-Kabir Town Islamabad project. So, the final date and venue are here for pre-launch of Al-Kabir Town Islamabad. The project will be launched on Thursday 25th, October 2018. The launching ceremony will be arranged at 06:00 PM, The Marquee Hall, Marriott Hotel, Islamabad. All other details of the project had already written on Propertyblog.pk. You can check its complete details by simply clicking here.